Earlier this year, we launched a survey to collect information about the adoption of flexible work initiatives within public accounting firms. We received valuable insights from 99 distinct firms and shared the overall results of the survey in my Survey Results blog. 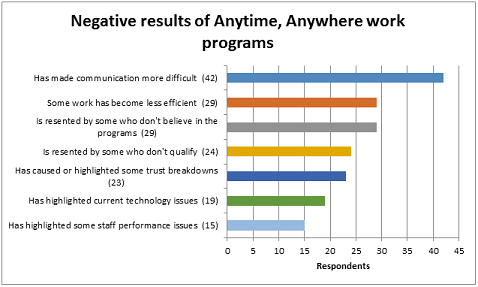 In this post, we’ll explore the positive and negative results firms experienced as a result of their anytime, anywhere work programs. Why offer anytime, anywhere work? From where we sit, the negative consequences of anytime, anywhere work that firms cited can be mitigated by shifting expectations and changing the way people communicate – leaving the “attachment” to face time and the need to be in the same physical proximity with someone behind. The fact that these programs highlighted trust and technology issues within firms is a positive – not a negative – consequence because those firms were then driven to get better. The positive impacts of virtual and flexible work practices seem to outweigh the negative results – both in the number of responses received, and in the impacts to the practices themselves. Anytime, anywhere work drives those firms who embrace it to improve our own leadership and management practices and that’s a good thing! In our next blog in this series, scheduled to be posted November 19, we’ll explore the way that firms measure the success of their people when they moved away from strictly time-based measures. Until then, what positive or negative impacts has your firm seen from your anytime, anywhere work programs? We’d love to hear from you!